The Scouter is a totally unique air rifle with a skeleton 'Shark Fin' styled stock, it offers a perfect mid sized rifle for juniors, or amateurs looking for an upgrade. Shooting and around 9ft/lbs, this rifle is perfect for plinking or target shooting or even close range vermin control. 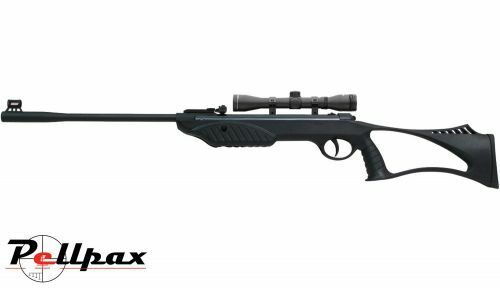 With a plastic shrouded barrel, synthetic stock and auto safety, this air rifle is ideal for target shooting at clubs or in back gardens to get started. We are now offering this as a combo including the air rifle and a quality 4x32 scope.